The « Glossary page » is one of the most important pages on Interpreters' Help. It allows you to quickly search your glossaries while you're in the booth. It's also the page where you can build your glossaries by adding lines and columns and editing terms. You can also create user-defined columns if the language you want to add is not in the list. You can also contact us to add a language to the list. Glossaries can have tags: private and/or public tags. Private tags can only be seen by you. 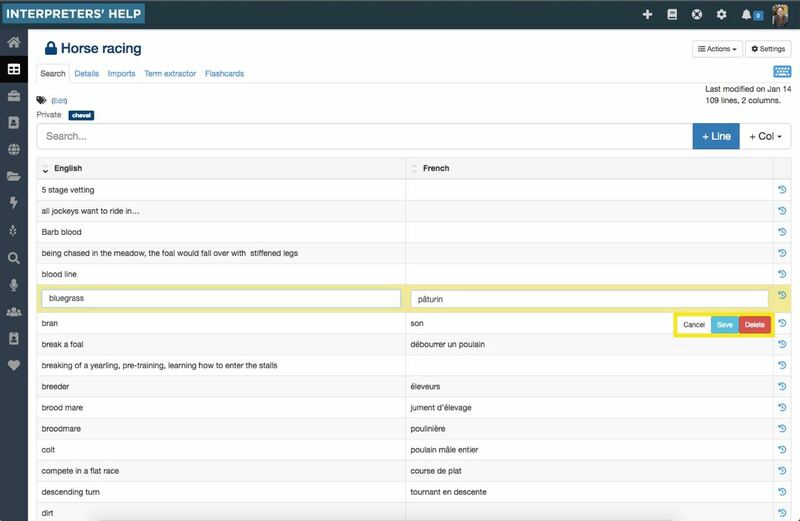 Public tags can be seen by everyone when you share a glossary publicly. They are useful for people searching for a glossary in the Glossary Farm. They can be used to categorize glossaries by themes. On the "Glossary page", you can edit the settings of a glossary by clicking on the "Settings" button. The Settings/Collaborators page allows you to add or remove collaborators (i.e. members who can view and/or edit the glossary) for a glossary. The search function is not case or accent sensitive. Interpreters' Help allows for various kinds of glossaries with different characteristics. In offering paying plans, we are also introducing the concept of "glossary slots." Why do we limit the size of glossaries? Because we think it's a good idea to keep glossaries small, since it tends to improve their coherence and quality. Also, extremely large glossaries use a lot of memory when loaded, which affects all users. You choose who can see and edit these glossaries. These come with our subscription plans and are limited to 3000 lines. When you register with Interpreters' Help, you get one free glossary slot, limited to 500 lines. These slots are private and editable without a subscription. If you registered with Interpreters' Help before the paying plans went into effect, i.e. during our beta period, any private glossaries you created during this period are exempted from the quota. There was no line limit when you created them; now, however, if your glossaries have more than 3000 lines, you won't be able to add any more lines to them. Free slots are limited to 500 lines. Once you have an active subscription, you might want to increase the size of one of your Free glossaries to 3000 lines, which is the limit for paying slots. To do so, you can "Upgrade" the glossary on the options page. This will change it to a paying slot, using up some of your subscription's paying slots credit. Once you upgrade a glossary, it becomes a paying slot; in other words, if it was free and editable without a subscription, it won't be anymore. Keep in mind that once you upgrade a glossary there’s no going back. Anyone can see these glossaries. You choose who can edit them. Public glossary slots are limited to 500 lines. You can import glossaries from Word, Excel, LibreOffice, OpenOffice, Google Drive (once you’ve downloaded the files). It doesn't matter whether or not your columns have headers. You choose which language applies to which column after importing a glossary. Columns for notes, comments, and acronyms are welcome! Cells are limited to 1000 characters. When you import from an Excel file, only the first sheet of the workbook will be imported. So if you want to import multiple sheets you need to re-upload the file with the sheet you wish to import in the front. From the "glossary page", press the "Import terms" button. Then, upload the file containing the terms to import. Once the file has been uploaded, wait until the preview is ready, then press the button to review it. Verify the terms and the languages detected, change them if necessary. Press the "Validate import" button to finish the import. You can import terms from multiple files in one glossary. You can also revert an import, on the glossary's import page. Don’t hesitate to contact us if you need assistance importing glossaries. Interpreters’ Help lets you work together with colleagues on a glossary – we call it collaboration. To add a collaborator, go to Settings/Collaborators on the glossary page. Public glossaries can easily be embed into your website, just like you would do for a Youtube video. Click the link: "Embed this glossary into my website"